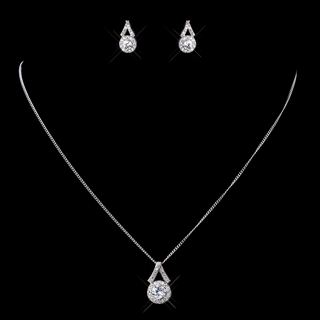 Our "Be Mine" cubic zirconia set includes a beautiful pendant necklace and matching pair of stud earrings. The main stone glistens exquisitely, surrounded by an array of smaller encrusted cubic zirconia stones on an antique silver-plated piece that is strung on a delicate rhodium silver chain. Size: The necklace measures 16" long with a 2-1/4" extender. The necklace drop measures 1-3/4" long x 1/2" wide. The matching earrings measure 0.6" long by 0.4" wide.